There are many in the world today who live in total darkness. Not the darkness that happens when the sun goes down. Or the kind of darkness on a moon less night. No, the kind of darkness described here comes from within. The absence of soul. The incapability of empathy. The easiness of doing wrong with no regret. That is darkness. In the book of Matthew Jesus is walking through the streets and demons recognize him. He (Jesus) acknowledges them as well. It is a must that we recognize darkness. It is sometimes disguised as shade, a little grey. It is all darkness. Call on GOD, loudly. Ask the angels to intercede. Darkness is not to be taken lightly. Follow the path with light. Be drawn to it. 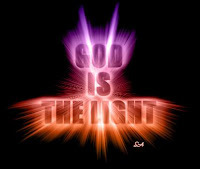 John 1:5 This is the message we have heard from him and declare to you: God is light; in him there is no darkness at all.